(Unfinished) In the midst of a slew of supervillain attacks, T-Bone meets a very unusual girl and takes a very unusual shine to her. But, with secrets, secret identities, and a tangle of villainous schemes, romance is a bit complicated. 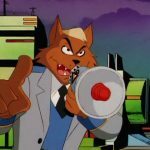 Lt. Steele’s so annoyed with the SWAT Kats, how far will he go to discover their identities? Further than Feral! In the aftermath of the horrors of Megakat’s drunken brawls, Feral and the SWAT Kats have to deal with a bomber and Steele’s annoying father. (Unfinished) In 1978 Professor Hackle was a young and ambitious scientist experimenting with time travel, unaware of the effect his experiment would have…. And, years later, all havoc breaks loose as, first, seemingly every foe the SWAT Kats have ever faced attacks MegaKat City at once, and then Dark Kat embarks on an even bolder scheme.